MS and MD series saws are designed for mitre saw machines to cut molding or picture frame material. 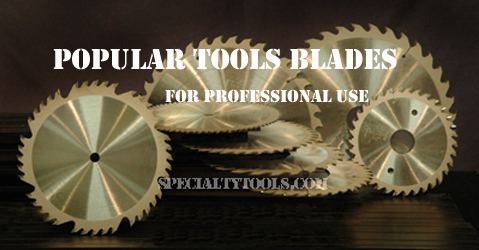 Blades with CTC design are made to cut any wood or light metal without changing blades for different materials. For heavy aluminum or when cutting only non-ferrous metals. ATB Alternate Top Bevel. This is the most popular, saw design, and with good reason. It is excellent for cutting operations with or against the grain, acheiving a high level of quality over a high range of cuts. Top beveled sever the material with a shearing action. Teeth alternate left and right top bevel. ATBR+R - Alternate Top Bevel plus Raker. For cut-off trimming operations on natural wood or undefined material. Top beveled teeth sever the material withshearing action alternating left and right, followed by a raking action flat top tooth to facilitate chip removal. CTC - California Triple Chip. Combining the best of the ATB's slicing action and the TCG's durablilty. CTC is a favorite design for those who need to cut a variety of materials. LRLRS - Left Right Left Right Straight. Similar to LR, with added straight raker every 5th tooth. This helps to remove sawdust from the cut, giving better blade cooling and preventing dust buildup in the sawblade. An excellent design for mitre box and sharp trimming of slightly thicker wood than with the LR design.